Rural flight (or rural exodus) is the migratory pattern of peoples from rural areas into urban areas. It is urbanization seen from the rural perspective. In modern times, it often occurs in a region following the industrialization of agriculture—when fewer people are needed to bring the same amount of agricultural output to market—and related agricultural services and industries are consolidated. Rural flight is exacerbated when the population decline leads to the loss of rural services (such as business enterprises and schools), which leads to greater loss of population as people leave to seek those features. Prior to the Industrial Revolution, rural flight occurred in mostly localized regions. Pre-industrial societies did not experience large rural-urban migration flows primarily due to the inability of cities to support large populations. Lack of large employment industries, high urban mortality, and low food supplies all served as checks keeping pre-industrial cities much smaller than their modern counterparts. Ancient Athens and Rome, scholars estimate, had peak populations of 80,000 and 500,000 paling in comparison with their current populations. The onset of the Industrial Revolution in Europe in the late 19th century removed many of these checks. As food supplies increased and stabilized and industrialized centers arose, cities began to support larger populations, sparking the start of rural flight on a massive scale. The United Kingdom went from having 20% of the population living in urban areas in 1800 to more than 70% by 1925. While the late 19th century and early 20th century saw much of rural flight focused in Western Europe and the United States, as industrialization spread throughout the world during the 20th century, rural flight and urbanization followed quickly behind. Today, rural flight is an especially distinctive phenomenon in some of the newer urbanized areas including China and more recently sub-Saharan Africa. The shift from mixed subsistence farming to commodity crops and livestock began in the late 19th century. New capital market systems and the railroad network began the trend towards larger farms that employed fewer people per acre. These larger farms used more efficient technologies such as steel plows, mechanical reapers, and higher-yield seed stock, which reduced human input per unit of production. The other issue on the Great Plains was that people were using inappropriate farming techniques for the soil and weather conditions. Most homesteaders had family farms generally considered too small to survive (under 320 acres), and European-American subsistence farming could not continue as it was then practiced. 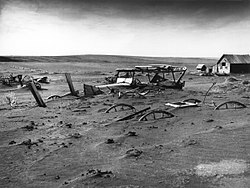 During the Dust Bowl and the Great Depression of the 1930s, large numbers of people fled rural areas of the Great Plains and the Midwest due to depressed commodity prices and high debt loads exacerbated by several years of drought and large dust storms. Rural flight from the Great Plains has been depicted in literature, such as John Steinbeck's novel The Grapes of Wrath (1939), in which a family from the Great Plains migrates to California during the Dust Bowl period of the 1930s. Post-World War II rural flight has been caused primarily by the spread of industrialized agriculture. Small, labor-intensive family farms have grown into, or have been replaced by, heavily mechanized and specialized industrial farms. While a small family farm typically produced a wide range of crop, garden, and animal products—all requiring substantial labor—large industrial farms typically specialize in just a few crop or livestock varieties, using large machinery and high-density livestock containment systems that require a fraction of the labor per unit produced. For example, Iowa State University reports the number of hog farmers in Iowa dropped from 65,000 in 1980 to 10,000 in 2002, while the number of hogs per farm increased from 200 to 1,400. The consolidation of the feed, seed, processed grain, and livestock industries has meant that there are fewer small businesses in rural areas. This decrease in turn exacerbated the decreased demand for labor. Rural areas that used to be able to provide employment for all young adults willing to work in challenging conditions, increasingly provide fewer opportunities for young adults. The situation is made worse by the decrease in services such as schools, business, and cultural opportunities that accompany the decline in population, and the increasing age of the remaining population further stresses the social service system of rural areas. The rise of corporate agricultural structures directly affects small rural communities, resulting in decreased populations, decreased incomes for some segments, increased income inequality, decreased community participation, fewer retail outlets and less retail trade, and increased environmental pollution. There are several determinants, push and pull, that contribute to rural flight: lower levels of (perceived) economic opportunity in rural communities versus urban ones, lower levels of government investment in rural communities, greater education opportunities in cities, marriages, increased social acceptance in urban areas, and higher levels of rural fertility. Some migrants choose to leave rural communities out of the desire to pursue greater economic opportunity in urban areas. Greater economic opportunities can be real or perceived. According to the Harris-Todaro Model, migration to urban areas will continue as long as "expected urban real income at the margin exceeds real agricultural product" (127). However, sociologist Josef Gugler points out that while individual benefits of increased wages may outweigh the costs of migration, if enough individuals follow this rationale, it can produce harmful effects such as overcrowding and unemployment on a national level. This phenomenon, when the rate of urbanization outpaces the rate of economic growth, is known as overurbanization. Since the industrialization of agriculture, mechanization has reduced the number of jobs present in rural communities. Some scholars have also attributed rural flight to the effects of globalization as the demand for increased economic competitiveness leads people to choose capital over labor. At the same time, rural fertility rates have historically been higher than urban fertility rates. The combination of declining rural jobs and a persistently high rural fertility rate has led to rural-urban migration streams. Rural flight also contains a positive feedback loop where previous migrants from rural communities assist new migrants in adjusting to city life. Also known as chain migration, migrant networks lower barriers to rural flight. For example, an overwhelming majority of rural migrants in China located jobs in urban areas through migrant networks. Some families choose to send their children to cities as a form of investment for the future. A study conducted by Bates and Bennett (1974) concluded that rural communities in Zambia that had other viable investment opportunities, like livestock for instance, had lower rates of rural-urban migration as compared to regions without viable investment opportunities. Sending their children into cities can serve as long-term investments with the hope that their children will be able to send remittances back home after getting a job in the city. There are severe challenges faced by poorer people in the agriculture sector because of diminishing access to productive farmland. Foreign investors through Foreign Direct Investment (FDI) schemes have been encouraged to lease land in rural areas in Cambodia and Ethiopia. This has led to the loss of farmland, range land, woodlands and water sources from local communities. Large-scale agricultural projects funded by FDI only employed a few experts specialized in the relevant new technologies. In other instances, rural flight may occur in response to social determinants. A study conducted in 2012 indicated that a significant proportion of rural flight in India occurred due to social factors such as migration with household, marriage, and education. Migration with households and marriage affect women in particular as most often they are the ones required to move with households and move for marriage, especially in developing regions. Rural youth may choose to leave their rural communities as a method of transitioning into adulthood, seeking avenues to greater prosperity. With the stagnation of the rural economy and encouragement from their parents, rural youth may choose to migrate to cities out of social norms – demonstrating leadership and self-respect. With this societal encouragement combined with depressed rural economies, rural youth form a large proportion of the migrants moving to urban areas. In Sub-Saharan Africa, a study conducted by Touray in 2006 indicated that about 15% (26 million) of urban migrants were youth. Lastly, natural disasters can often be single-point events that lead to temporarily massive rural-urban migration flows. The 1930s Dust Bowl in the United States, for example, led to the flight of 2.5 million people from the Plains by 1940, many to the new cities in the West. It is estimated that as many as one out of every four residents in the Plains States left during the 1930s. More recently, drought in Syria from 2006-2011 has prompted a rural exodus to major urban centers. Massive influxes in urban areas, combined with difficult living conditions, have prompted some scholars to link the drought to the arrival of the Arab Spring in Syria. The terms are used in the United States and Canada to describe the flight of people from rural areas in the Great Plains and Midwest regions, and to a lesser extent rural areas of the northeast and southeast and Appalachia. It is also particularly noticeable in parts of Atlantic Canada (especially Newfoundland), since the collapse of Atlantic cod fishing fields in 1992. China, like many other currently industrializing countries, has had a relatively late start to rural flight. Until 1983, the Chinese government, through the hukou system, greatly restricted the ability of their citizens to internally migrate. Since 1983, the Chinese government has progressively lifted the restrictions on internal migration. This has led to a great increase in the number of people migrating to urban areas. However, even today, the hukou system limits the ability of rural migrants to receive full access to urban social services at the urban subsidized costs. As with most examples of rural flight, several factors have led towards China’s massive urbanization. Income disparity, family pressure, surplus labor in rural areas due to higher average fertility rates, and improved living conditions all play a role in contributing to the flows of migrants from rural to urban areas. Approximately, 250 million rural migrants now live in cities with 54% of the total Chinese population living in urban areas. A focus by landowners on efficient production led to the enclosure of the commons in the 16th and 17th centuries. This created unrest in rural areas as tenants were then unable to graze their livestock. They sometimes resorted to illegal means to support their families.. This was followed, in turn, by penal transportation which sent offenders out of the country, often Australia. Eventually, economic measures produced the British Agricultural Revolution. Rural flight has been occurring to some degree in Germany since the 11th century. A corresponding principle of German law is Stadtluft macht frei ("city air makes you free"), in longer form Stadtluft macht frei nach Jahr und Tag ("city air makes you free after a year and a day"): by custom and, from 1231/32, by statute, a serf who had spent a year and a day in a city was free, and could not be reclaimed by their former master. Landflucht ("flight from the land") refers to the mass migration of peasants into the cities that occurred in Germany (and throughout most of Europe) in the late 19th century. In 1870 the rural population of Germany constituted 64% of the population; by 1907 it had shrunk to 33%. In 1900 alone, the Prussian provinces of East Prussia, West Prussia, Posen, Silesia, and Pomerania lost about 1,600,000 people to the cities, where these former agricultural workers were absorbed into the rapidly growing factory labor class; One of the causes of this mass-migration was the decrease in rural income compared to the rates of pay in the cities. Landflucht resulted in a major transformation of the German countryside and agriculture. Mechanized agriculture and migrant workers, particularly Poles from the east (Sachsengänger), became more common. This was especially true in the province of Posen that was gained by Prussia when Poland was partitioned. The Polish population of eastern Germany was one of the justifications for the creation of the "Polish corridor" after World War I and the absorption of the land east of the Oder-Neisse line into Poland after World War II. Also, some labor-intensive enterprises were replaced by much less labor-intensive ones such as game preserves. The word Landflucht has negative connotations in German, as it was coined by agricultural employers, often of the German aristocracy, who were lamenting their labor shortages. The rural exodus of Scotland followed that of England, but delayed by several centuries. Consolidation of farms and elimination of inefficient tenants occurred over about 110 years from the 18th to the 19th centuries. Samuel Johnson encountered this in 1773 and documented it in his work A Journey to the Western Islands of Scotland. He deplored the exodus but did not have the information to analyze the problem. Rural flight and out-migration in Sweden can be traced in two distinct waves. The first, beginning in the 1850s when 82% of the Swedish population lived in rural areas, and continuing till the late 1880s, was mostly due to push factors in the countryside related to poverty, unemployment, low agricultural wages, debt peonage, semi-feudalism, and religious oppression by the State church. Most of the migration was ad-hoc and directed towards emigration to the three big cities of Sweden, America, Denmark, or Germany. Many of these first emigrants were unskilled, barely literate laborers who sought farm work or daily wage labour in the cities. The second wave started from the late 1890s and reached its peak between 1922 and 1967, with the highest rates of rural flight occurring in the 1920s and the 1950s. This was mostly "pull factors" due to the economic boom and industrial prosperity in Sweden wherein the massive economic expansion and wage increases in the urban areas pulled young people to migrate for work and at the same time drove down work opportunities in the countryside. Between 1925 and 1965, Sweden's GDP per capita increased from USD 850 to USD 6200. Simultaneously, the percentage of the population living in rural areas decreased drastically from 54% in 1925 to 21% in 1965. Rural flight began later for Russia and the former states of the USSR than in Western Europe. In 1926 only 18% of Russians lived in urban areas, compared to over 75% at the same time in the United Kingdom. Although the process began later, throughout World War II and the decades immediately proceeding, rural flight proceeded at a rapid pace. By 1965, 53% of Russians lived in urban areas. Statistics compiled by M. Ya Sonin, a Soviet author, in 1959, demonstrate the rapid urbanization of the USSR. Between 1939 and 1959, the rural population declined by 21.3 million, while that of urban centers increased by 39.4 million. Of this dramatic shift in population, rural flight accounts for more than 60% of the change. Generally, most rural migrants tended to settle in cities and towns within their district. Rural flight persisted through the majority of the 20th century. 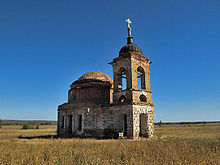 However, with the end of the Soviet Union, rural flight reversed as political and economic instability in the cities prompted many urban dwellers to return to rural villages. Rural flight did not occur uniformly throughout the USSR. Western Russia and Ukraine experienced the greatest declines in rural population, 30% and 17% respectively. Conversely, peripheral regions of the USSR, like Central Asia, experienced gains, contradicting the general pattern of rural-urban migration of this period. Increased diversification of crops and labor shortages were primary contributors to the gains in rural population in the periphery. Rural flight in Russia and the former USSR had several major determinants. The industrialization of agriculture, which came later in Russia and the former USSR, led to declines in available rural jobs. Lower living standards and tough work also motivated some peasants to migrate to urban areas. In particular, the Soviet kolkhoz system (the collective farms in the Soviet Union) aided in maintaining low living standards for Soviet peasants. Beginning around 1928, the kolkhoz system replaced family farms throughout the Soviet Union. Forced to work long hours for low pay at rates fixed by the government and often unadjusted to inflation, Russian peasants experienced quite low living-conditions - especially compared to urban life. While Brezhnev's wage reforms in 1965 ameliorated the low wages received by peasants, rural life remained suffocating, especially for the skilled and the educated. Although migrants came from all segments of society, several groups were more likely to migrate than others. 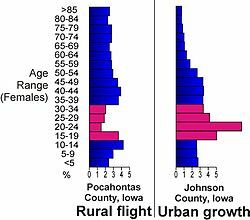 Like other examples of rural flight, the young were more likely than the old to migrate to the cities. Young women under 20 were the most likely segment of the population to leave rural life. This exodus of young women further exacerbated the demographic transitions occurring in rural communities as the rate of natural increase dropped precipitously over the course of the 20th century. Lastly, the skilled and educated were also likely to migrate to urban areas. Rural flight in Mexico occurred throughout the 1930s up until the present day. Like other developing nations, the beginning of industrialization in Mexico quickly accelerated the rate of rural flight. In the 1930s, President Cardenas implemented a series of agricultural reforms that led to massive redistribution of agricultural land among the rural peasants. Some commentators have subsequently dubbed the period from 1940-1965 as the "Golden Era for Mexican Migration." During this period, Mexican agriculture grew at an average rate of 5.7% outpacing the natural increase of 3% of the rural population. Concurrently, government policies favoring industrialization led to a massive increase of industrial jobs in the cities. Statistics compiled in Mexico City demonstrate this trend with over 1.8 million jobs created over the course of the 1940s, 50s, and 60s. Young people with schooling were the segment of population most likely to migrate away from rural life to urban life, attracted by the promise of many jobs and a more modern lifestyle as compared to the conservative conditions in rural villages. Additionally, due to the large demand for new workers, many of these jobs had low entrance requirements that also provided on-site job training opening the avenue for migration to many rural residents. From 1940 to about 1965, rural flight occurred in a slow, yet steady pace with both agriculture and industry growing concurrently. However, as government policies increasingly favored industry over agriculture, rural conditions began to deteriorate. In 1957, the Mexican government began to regulate the price of maize through massive imports in order to keep low urban food costs. This regulation severely undercut the market price of maize lowering the profit margins of small farmers. At the same time, the Green Revolution had entered into Mexican agriculture. Inspired by the work of Norman Borlaug, farmers that employed hybrid seeds and fertilizer supplements were able to double or even triple their yields per acre. Unfortunately, these products came at a relatively high cost, out of the reach of many farmers struggling after the devaluation of the price of maize. The combined effects of the maize price regulation and the Green Revolution was the consolidation of small farms into larger estates. A 1974 study conducted by Osorio concluded that in 1960, about 50.3% of the individual land plots in Mexico contained less than 5 hectares of land. In contrast, the top 0.5% of estates by land spanned 28.3% of all arable land. As many small farmers lost land, they either migrated to the cities or became migrant workers roving from large estate to large estate. Between 1950 and 1970, the proportion of migrant workers increased from 36.7% to 54% of the total population. The centralized pattern of industrial development and government policies overwhelmingly favoring industrialization contributed to massive rural flight in Mexico beginning in the late 1960s until the present day. Rural migrants to cities face several challenges that may hinder their quality of life upon moving into urbanized areas. Many migrants do not have the education or skills to acquire decent jobs in cities and are then forced into unstable, low paying jobs. The steady stream of new rural migrants worsens underemployment and unemployment, common among rural migrants. Employers offer lower wages and poorer labor conditions to rural migrants, who must compete with each other for limited jobs, often unaware of their labor rights. Rural migrants often experience poor living conditions as well. Many cities have exploded in population; services and infrastructure, in these cities, are unable to keep up with population growth. Massive influxes in rural population can lead to severe housing shortages, inadequate water and energy supply, and general slum-like conditions throughout cities. Additionally, rural migrants often struggle adjusting to city life. In some instances, there are cultural differences between the rural and urban areas of a region. Lost in urban regions, it becomes difficult for them to continue holding onto their cultural traditions. Urban residents may also look down upon these newcomers to the city who are often unaware of city social norms. Both marginalized and separated from their home cultures, migrants face many social challenges when moving to cities. Women, in particular, face a unique set of challenges. Some women undergo rural flight to escape domestic abuse or forced early marriages. Some parents choose to send women to cities to find jobs in order to send remittances back home. Once in the city, employers may attempt to take advantage of these women preying on their unfamiliarity with labor laws and social networks on which to rely. In the worst of cases, destitution may force women into prostitution, exposing them to social stigma and the risks of sexually transmitted diseases. ^ a b c d e Weeks, John (2012). Population: an introduction to concepts and issues. Belmont, CA: Wadsworth, Cengage Learning. pp. 353–391. ^ Davis, Kingsley (1965). "The Urbanization of the Human Population" (PDF). Scientific American. 213 (3): 40. Bibcode:1965SciAm.213c..40D. doi:10.1038/scientificamerican0965-40. Retrieved 13 March 2014. ^ Juan, Shan. "Rural exodus to cities continue". China Daily. Retrieved 13 March 2014. ^ "Living with Hogs in Rural Iowa". Iowa Ag Review. Iowa State University. 2003. Retrieved 25 November 2009. ^ Harris, John. "Migration, Unemployment and Development: A Two-Sector Analysis" (PDF). American Economic Association. Retrieved 13 March 2014. ^ Perz, Stephen (2000). "The Rural Exodus in the Context of Economic Crisis, Globalization, and Reform in Brazil". The International Migration Review. 34 (3): 842–881. JSTOR 2675947. ^ Bates, Robert (1974). "Determinants of the Rural Exodus in Zambia". Cahiers d'Études Africaines. 14 (55): 543–564. JSTOR 4391333. ^ Robinson-Pant, Anna (2016). Learning knowledge and skills for agriculture to improve rural livelihoods (PDF). UNESCO. pp. 90–91. ISBN 978-92-3-100169-7. ^ Hassan, Tarique; Khan, Jabir (December 2012). "Determinants of Rural Out-Migration in India". International Journal of Advanced Research in Management and Social Sciences. 1 (12). Retrieved 13 March 2014. ^ a b c d Min-Harris, C. "Youth migration and poverty in Sub-Saharan Africa: Empowering the Rural Youth" (PDF). Disponible en ligne dans le site. Retrieved 13 March 2014. ^ "Mass Exodus from the Plains". PBS. Retrieved 13 March 2014. ^ Aukalh, R. (16 March 2013). "A rural exodus as drought takes hold of Syria". Toronto Star. Retrieved 13 March 2014. ^ a b "China's cities: The Great Transition". The Economist. 21 March 2014. Retrieved 18 April 2014. ^ "Labour Migration". International labour organization. Retrieved 18 April 2014. ^ Beresford, Maurice (1998). "The Lost Villages of England (Revised ed.)". Sutton. ^ Shoemaker, Robert B. (1999). "Prosecution and Punishment. Petty crime and the law in London and rural Middlesex, c. 1660–1725". Essex: Longman: Harlow. ISBN 978-0-582-23889-3. ^ SchapiroShotwell; 1922, p. 300. ^ a b Mises2006, p. 8. ^ a b Shafir 1996, p. 150. ^ Drage 1909, p. 77. ^ McLean, Kromkowski 1991, p. 56. ^ Richards, Eric (2008). "Answers and Questions". The Highland Clearances: People, Landlords and Rural Turmoil. Edinburgh: Birlinn Ltd.
^ Johnson, Samuel (2006) . A Journey to the Western Islands of Scotland and the Journal of a Tour to the Hebrides (James Boswell ed.). London: Penguin UK. ^ a b c d e Wadekin, Karl-Eugen (October 1966). "Internal Migration and the Flight from the Land in USSR". Soviet Studies. 18 (2): 131–152. doi:10.1080/09668136608410523. JSTOR 149517. ^ Sonin, M. Ya. (March 1959). "Vosproizvodstvo rabochei sily v SSSR i balans truda": 144. ^ a b c Wegren, Stephen K. (July 1995). "Rural Migration and Agrarian Reform in Russia: A Research Note". Europe-Asia Studies. 47 (5): 877–888. doi:10.1080/09668139508412292. JSTOR 152691. PMID 12320195. ^ a b c d e f Arizpe, Lourdes (Winter 1981). "The Rural Exodus in Mexico and Mexican Migration to the United States". International Migration Review. 15 (4): 626–649. doi:10.2307/2545516. JSTOR 2545516. ^ Thurow, Roger; Kilman, Scott (2009). Enough: Why the World's Poorest Starve in an Age of Plenty. New York, NY: PublicAffairs. ^ Shaw, R. Paul (October 1974). "Land Tenure and the Rural Exodus in Latin America". Economic Development and Cultural Change. 23 (1): 123–132. doi:10.1086/450773. JSTOR 1153146. ^ Osorio, S.R (1974). "Estructura Agrariay Desarrollo Agricola en Mexico". Mexico: Fondo de Cultura Economica.